Today Hundred House is a small hamlet but it was once regarded as a strategic location and was fortified by both Romans and Normans during their respective conquests. Colwyn Roman Fort was raised in the first century AD and occupied for a couple of decades. In the eleventh century the Normans built the Mount but, after repeated Welsh attacks, replaced it with Colwyn Castle. 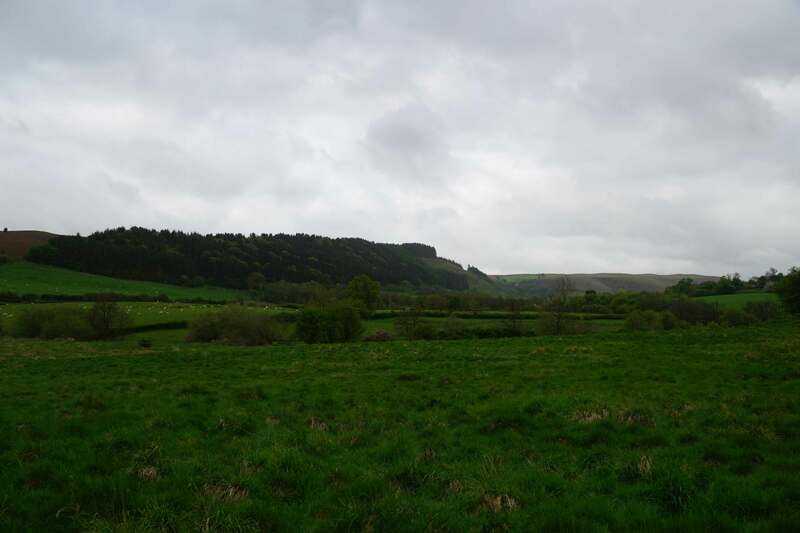 Although today only a small hamlet, Hundred House was deemed to be strategically important by both Romans and Anglo-Norman Marcher Lords, presumably due to the lines of communication afforded by the River Edw and an overland route that ran east/west between Radnor and Builth Wells. A Roman Fort was established near the site during the Flavian period (AD 69 - AD 96). The local populace may have been part of the Silures tribe, who opposed the Romans, and in AD 75 the Second Augustan Legion (Legio II Augusta) was moved to Caerleon in order to suppress them. It is possible Colwyn Roman Fort was an outpost associated with this operation. However the Silures tended to be concentrated in coastal sites and therefore the fort may have been part of later campaigns against the more northerly Ordovices tribe. Colwyn Roman Fort enclosed a little under seven acres and was configured in a 'playing card' layout orientated with a north-east to south-west axis. The defences would have included V-shaped ditches backed by earth ramparts topped with a timber palisade. The Colwyn brook ran to the north and south of the fort providing both a water source and extra security. The fort would have been garrisoned by an Auxiliary Regiment, non-citizen soldiers that were drawn from the wider Roman empire. No evidence has yet been found of a vicus (civilian settlement) or any connecting Roman roads suggesting the fort was only a temporary military outpost. Occupation certainly seems to have ceased around the early second century AD. As the Anglo-Norman Marcher Lords sought to expand their control of Central Wales in the late eleventh century, an earth and timber motte-and-bailey castle, now known as The Mount, was raised adjacent to the River Edw. Intended to serve as the caput of the Lordship of Elfael and the centre of the hundred of Colwyn, the fortification was raised in 1093 by Ralph Tosny of Clifford and subsequently seized by the forces of Madog ab Idnerth in 1135. By 1144 it was back in Anglo-Norman hands and was being rebuilt by Hugh Mortimer of Wigmore. The Mount consisted of a large oval mound which was originally topped by a masonry structure (or a timber structure with stone foundations). A area enclosed by a ditch and bank to the east of the motte was presumably a bailey. Little is known about the Mount thereafter and it is probable it was destroyed or captured by Welsh supporters of Matilda during the Anarchy (1139-54). It was rebuilt by William de Braose in 1195 but destroyed the following year by Rhys ap Gruffydd, Lord Rhys. After the destruction of the Mount in 1196, William de Braose rebuilt the castle on a different site. 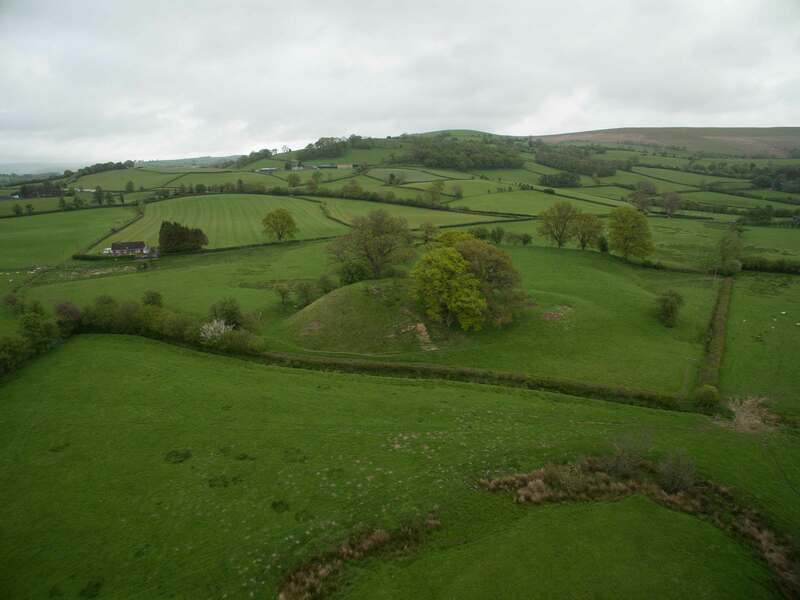 Using the earthworks of the former Roman fort, he built a new motte-and-bailey fortification. The mound was built over the Roman north-east gate whilst the bailey was formed from the original perimeter of the fort. William was suspected of disloyalty by King John (who infamously starved to death William's wife and son) and Colwyn Castle, along with the rest of the de Braose estates, were seized by the Crown in 1208. Thereafter it came into the hands of Gwallter ab Einion Clud who held it on behalf of Llywelyn ab Iorwerth. On the death of Llywelyn in 1240 the occupants switched their allegiance to Henry III and a stone keep was erected on the motte shortly after. By 1248 the entire Lordship of Elfael was under the control of Sir Owain ap Maredudd ab Einion Clud. However by the mid-1250s Llywelyn ap Gruffudd (the Last) had started to restore Welsh power and took possession of Builth Wells in 1260. With that nearby fortress under the control of the Welsh Prince, Owain clearly felt his position at Colwyn Castle was untenable and he surrendered the castle to Llywelyn in July 1260. Llywelyn ap Gruffudd reached the peak of his power with the sealing of the Treaty of Montgomery (1267) but it was not to last and the First War of Welsh Independence (1276-7) saw his political achievements crumble. At some point either during or before the war, Owain was restored to Colwyn Castle. However in December 1282 he supported the uprising that turned into the Second War of Welsh Independence (1282-3). As the Welsh were crushed by the Anglo-Norman military machine, Colwyn was seized by the Mortimer family. With Colwyn Castle back in Anglo-Norman hands the structure was rebuilt once more, allegedly by Maud Mortimer, and is sometimes referred to as Maud's Castle as a result. By 1309 it had passed into the hands of the Beauchamp family, Earls of Warwick. It continued in use during the early fourteenth century but was then superseded by Painscastle Castle. Colwyn was not attacked during the rebellion of Owain Glyndŵr suggesting it had been abandoned by this time. 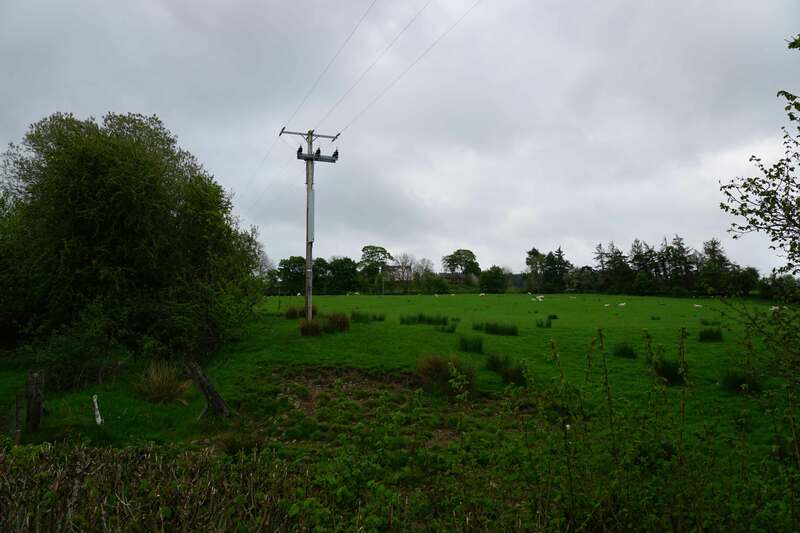 Today the site is occupied by Fforest Farm with no public access although the earthworks can be seen from the public road. The slight remains of a third motte exist on top of Fforest Hill. Little is known about this site and its position is more indicative of a watchtower rather than a practical fortification. A walk to the summit offers superb views of the surrounding area including a clear view of the Colwyn Castle/Colwyn Roman Fort site. Frere, S (2004). The Roman Fort at Colwyn Castle, Powys (Radnorshire). Britannia, 35, 115-120. CADW (2016). The Mount Mound and Bailey Castlem Hundred House RD036. Cardiff. Spurgeon, C. (1974). Colwyn Castle. Archaeology in Wales. 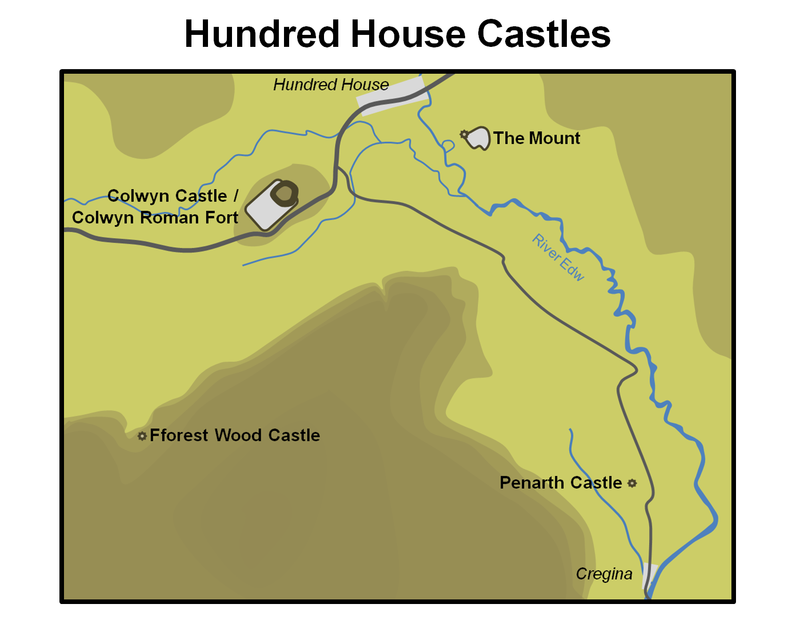 Hundred House boasts earthwork remains of the Mount, Colwyn Castle (including the Roman Fort) and Fforest Wood Castle although only the latter is accessible to the public. The Mount can be viewed at a distance from a public footpath accessed opposite the Hundred House Inn. Colwyn Castle is a working farm with no access but the earthworks can be seen from the main road. 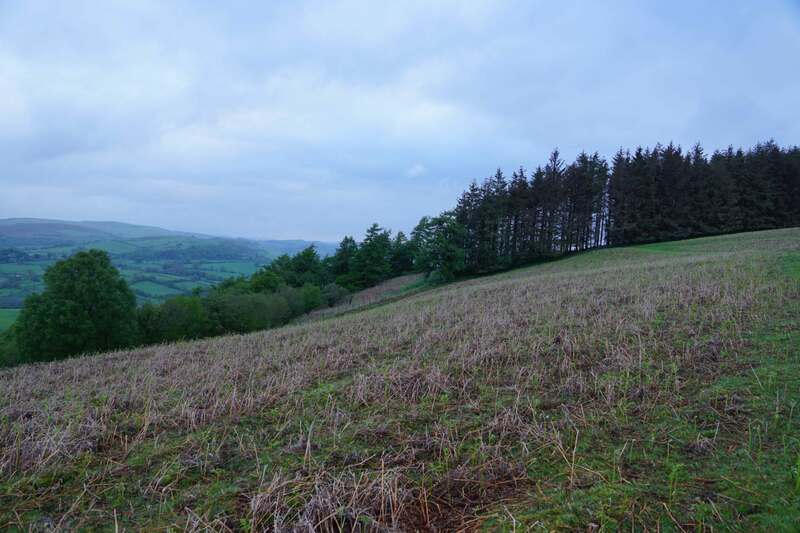 Fforest Wood Castle exists only as slight earthworks but a walk to the summit provides superb views of the surrounding area. Colwyn Castle and Roman Fort. The Roman fort was configured in a playing card shape. The site was re-used when Colwyn Castle was built in the late twelfth century with the motte added to one side of the former fort. The pink house in the photos occupies the summit of the motte. The Mount. 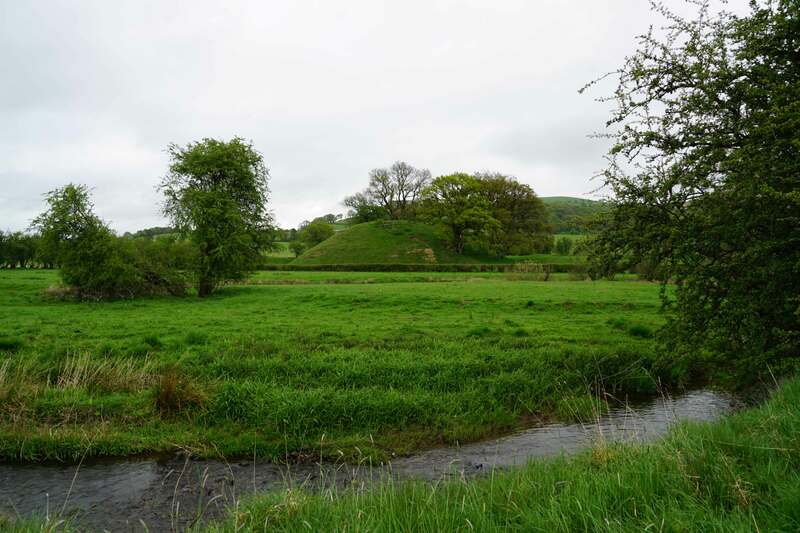 Probably the first motte-and-bailey castle built by the Anglo-Normans at Hundred House. It was attacked on numerous occasions by the Welsh before being finally destroyed in 1196. Thereafter Colwyn Castle was built. Fforest Wood Castle. A motte was built at the top of Fforest Wood Hill (seen in the left photo). It's origin is uncertain and it probably simply served as an observation tower. Hundred House Castles. Four castles were built in vicinity of Hundred House. Details of Penarth Castle can be found here. Hundred House. Despite the decline of Colwyn Castle, the courts of the Colwyn hundred were held on the site until the nineteenth century (at which point they moved to Builth). 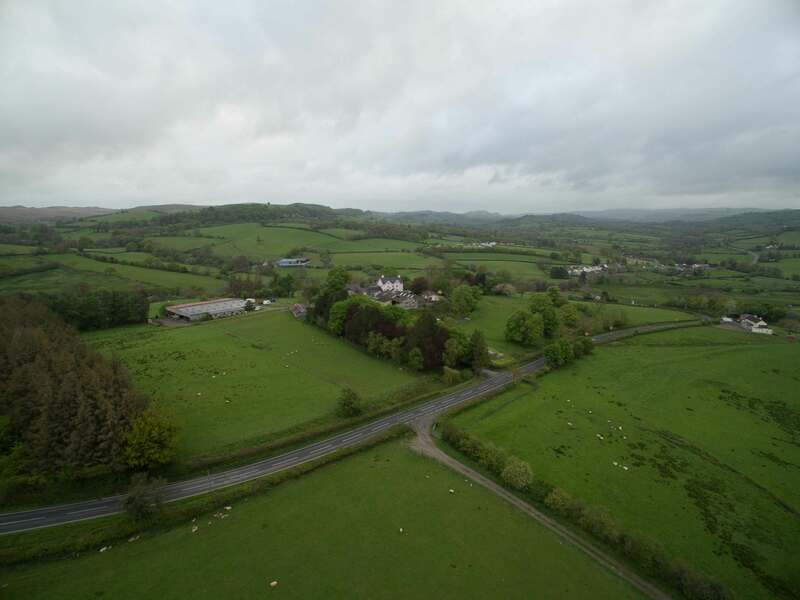 The A481 runs through Hundred House and there is a central car park for visitors. It is only a short walk to the Mount and a round trip of approximately 3 miles to/from Fforest Wood Castle (passing Colwyn Castle en route).